With an increasingly connected world and the Internet of things, it’s good that consumers are becoming more comfortable sharing their personal information on line. But there’s a catch: they want more control over how that information is used, and what information is available about them. The 2015 Digital Trends report from Microsoft Corp. shows some interesting shifts in our relationship with technology. We’re becoming more digitally savvy and willing to share information about our personal lives online, particularly if there’s a benefit for us. But we also want more control over how our information is used. And importantly for marketers, fluidity between our online and offline experiences. 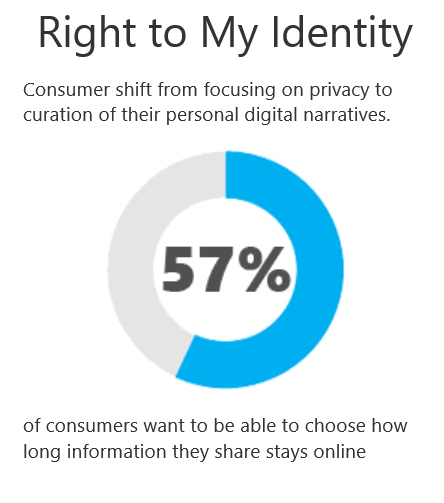 According to the report, 57 per cent of consumers want to be able to control how long information about them stays online, and 80 per cent are interested in identity management services. And if they’re going to provide their data, they want both knowledge and value, with 75 per cent saying it’s important that they know how companies are using their personal data, and 49 per cent wanting to know how they can get rewards from companies in exchange for sharing their data. Nearly half of consumers said they’re more likely to engage with digital experiences that integrate seamlessly with their physical world, so brands that can merge the two in an interesting way will see increased engagement. There’s a shift happening from social groups based on a fixed interest or activity to more flexible, temporal networks. More than half of consumers said they’d be more likely to interact with a brand that is specific to their interests, so fluidity of interaction will increase brand engagement. Consumers are looking for recommendations about solutions they didn’t know they needed — 48 per cent said they expect brands to help them find new products and services — so brands need to tap into new ways to facilitate interactions based on consumer interests. You can track us if it’s going to help us. Some 39 per cent of respondents said they’re fine if brands or services track and analyze data about them if it means optimizing shopping and services just for them. “Underlying all the trends is a need for marketers to use data in intelligent ways that benefit consumers. Consumers today want transparency, personalization, and relevant content that adds to their experiences with technology,” said Hritzuk. Does your business follow these 'best of the best' marketing practices?